Speech of the US State Department special envoy for Afghan peace Dr. Zalmay Khalilzad at US Institute of Peace once again showed that there is big difference of opinion between him and President Mohammad Ashraf Ghani. 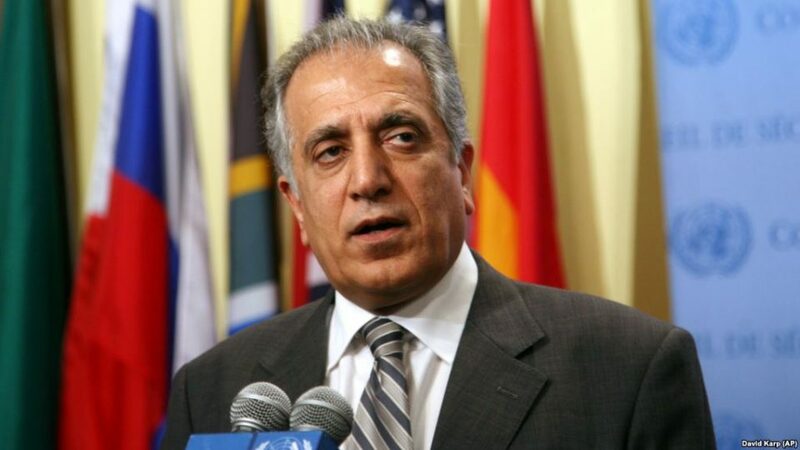 Dr. Khalilzad said, serious problem in his diplomacy is this that Talban don’t talk Kabul government. But the signs indicate that this group is declined to talk the government meeting with the participation of representatives of other groups and political parties. Khalilzad speech shows that Taliban are ready to sit at talk table with influential figures, political parties and groups and if the government also attend the talks as a group not as the government, the Taliban would not object. This issue means that the government should downside itself in talks at a group level. For example if in the Doha expected meeting the government representatives attend the talks as a group, Taliban may not disagree. It was clear from Khalilzad speech that he was not disagreed with this issue. He doesn’t disagree that the Afghan government leaders be satisfied with the downsizing the role of this government at a level of a group in dialogue with the Taliban. It seems that Khalilzad wants the Afghan government to change its position and accept its downsizing at a grouplevel. Khalilzad frankly said that to reach an agreement on ending of war he is in a hurry and wants this agreement to be signed prior to upcoming presidential elections. This issue is not acceptable to president Ghani. Ghani is rightly concerned on the future constitutional based system. If today current constitutional based system is omitted at the request of one group and be replaced by another system and constitution, other groups may tomorrow make effort to change it through power. So this tradition should not be created. Current system, should be protected. Afghanistan constitution has legally guaranteed many democratic values which are the desire of most progressive movements of the world. It is clear that every constitution could be amended and our present constitution is not an exception from this rule. According to a number of Afghan political forces, this constitution has shortages. Each group including Taliban has the right to put its amendment draft on the talks table with the government. The principle of republic and our country’s religious identity are not amendable. Without the principle of republic, Afghanistan is not possible to achieve stability. In the past we had been witnessing that certain political forces had tried to grab power through military coup and then imposed their opinion on the society through forceful means. Armed resistances against the then governments in Afghanistan had roots to an extent in this issue. Republican government based political system paves the way to all political groups to compete within legal political organizations to gain power or share it. The principle of republic introduces citizen as the owner of political power. If the principle of republic is omitted from the constitution, the rulers should define another criterion for political legitimacy. Experiences have shown that except the vote of citizens, no other principle confirm legitimacy of rulers. Therefore the principle of republic is unchangeable, but political groups and lawyers could recommend and suggest amendment draft of the constitution for further expansion of democracy and better protection of citizens’ rights and freedoms. The mechanism on amendment of the constitution has already been anticipated in it. Based on the constitution, transferring of power takes place only and only based on election, and no source has the abrogation authority of Afghanistan constitution.